By recycling paper, you are showing your appreciation of the Earth. According to Go Green, every ton of recycled paper saves 17 trees. Paper recycling involves recovering paper waste and remaking it into new paper products. Scrap paper is suitable for recycling and is often used to produce packaging products. Post-consumer paper waste such as printer paper and magazines are also suitable for recycling and in some cases can be taken to the paper mill for a small refund. The amount of money you can earn by recycling paper will vary depending on where you live and where the paper is taken. The amount you receive for recycling will also depend on the quality and grade of paper. Community curbside paper recycling programs follow a single-stream recycling approach. Single streams means you no long have to spend time bundling or preparing the paper. 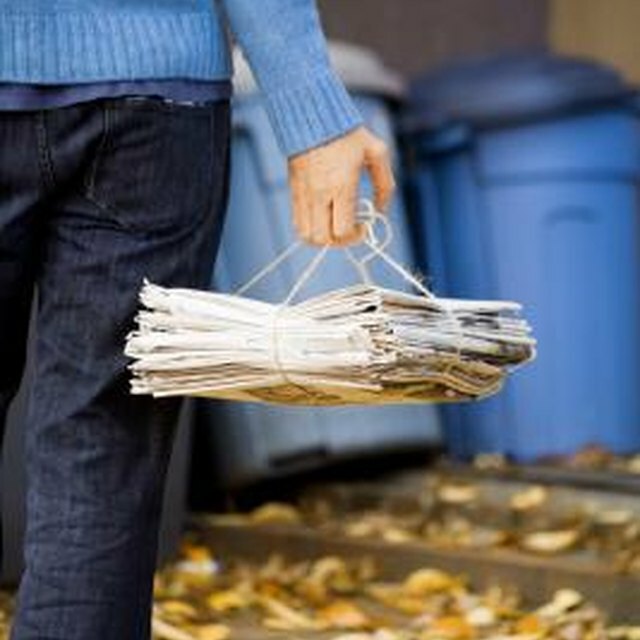 Curbside recycling programs provide you with a wheeled cart for the paper. Some programs require that you separate the paper by weight and type and others allow you to put different types of papers in the same cart to be separated by the recycling center staff. Not all curbside programs pay for paper recycling; contact your local curbside recycling program for rates. Drop-off recycling centers take high-grade and mixed-grade office paper: paper commonly found in offices, including copy paper and envelopes. Some centers also accept co-mingled paper products such as magazines, catalogs and newspapers. Drop-off centers are commonly run by a city’s solid waste management department. According to the U.S. Environmental Protection Agency, 80 to 90 percent of waste in the average workplace is recyclable. Participating in an office recycling program won’t just reduce the staffs’ carbon footprints, but could also result in significant savings for the company. Paper-products are workplace recycle favorites because paper waste is usually plentiful. Recycling paper in the workplace can generate a small amount of revenue for the company and result in trash pickup savings. School recycling programs are a great way to get children involved in recycling and teach them about environmental compassion. Parents can also participate in the program by dropping off paper contributions. School recycle teams empty the collection containers into larger bins on site and a recycling company picks them up. The rates for recycling pickups vary by the company and not all companies pay out.